Heavy rain caused a 40,000 cubic metre slip to completely close SH6 for several weeks in September 2013. Once cleared the road remained closed at night due to the continued high risk of rockfall from over 250 up the slip face. Some of the unstable rocks were larger than 20 foot shipping containers. 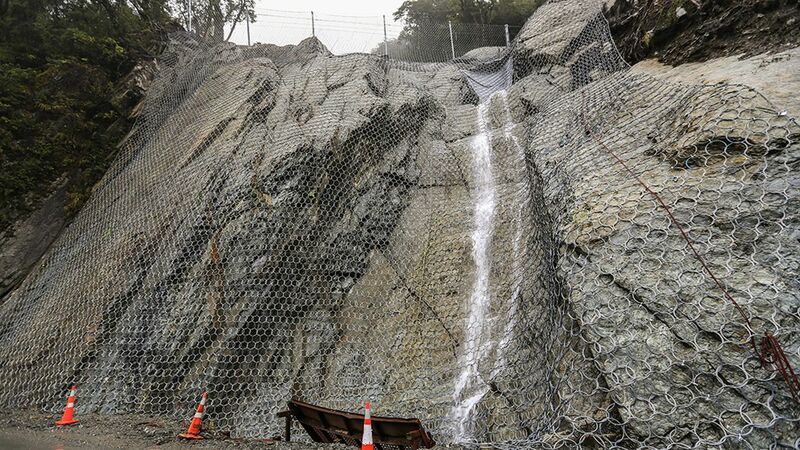 Geovert were awarded the contract to design and build a bepoke rockfall protection solution above the State Highway to actively control the frequent high energy rockfalls. 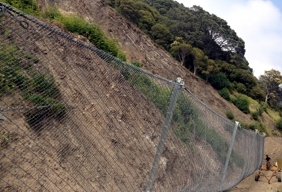 The best solution for site was the construction of a 5m high 3000kJ and 2 6m high 5000kJ rockfall barrier attenuators. 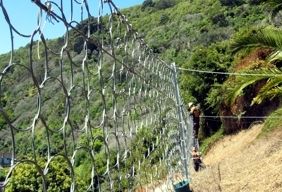 The 3000kJ system was installed over 250m above the highway, the first of the 5000kJ systems installed 150m up and the final and largest barrier was installed around 50m above the road. 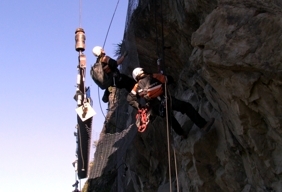 The bottom rockfall attenuator was a massive structure with a 35t high tensile steel ROCCO ring next drape to control and channel the falling rocks and debris to the roadside for the maintenance crews to clear. The project ran through winter in very wet and icy conditions which made the already difficult task to construct the barriers significantly more complex. 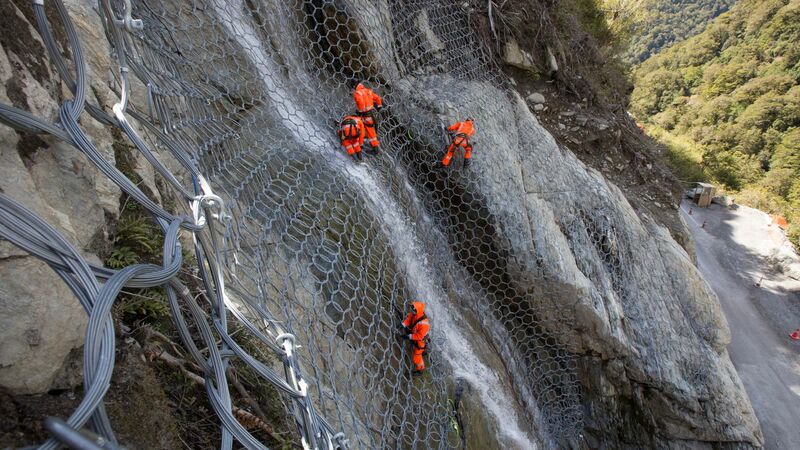 Safety was paramount and as the project team were working all day in an active rockfall zone, very careful inspection and control measures were developed and monitored to ensure personnel safety at all times. 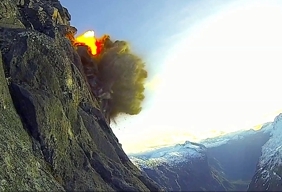 All the barriers were tested multiple times with high flux and high energy rockfall impacts caused from the controlled blasting of the largest boulders to reduce them down to the design size. The success of the project delivery was a result of the entire project team working together. 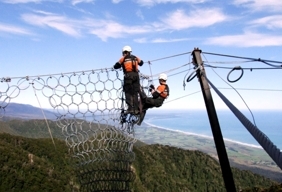 Detailed planning, risk assessments and open communication between the NZTA, Opus & Sicon Fergusson from the very outset ensured the very complex project was delivered safely to allow the road to permanently reopen to the public.